She’s baaaaaaack. Charlotte Richards has returned into the orbit of all our favorite folks and there’s definitely still some cleanup left to do after everything that went down on the beach during last season’s finale. 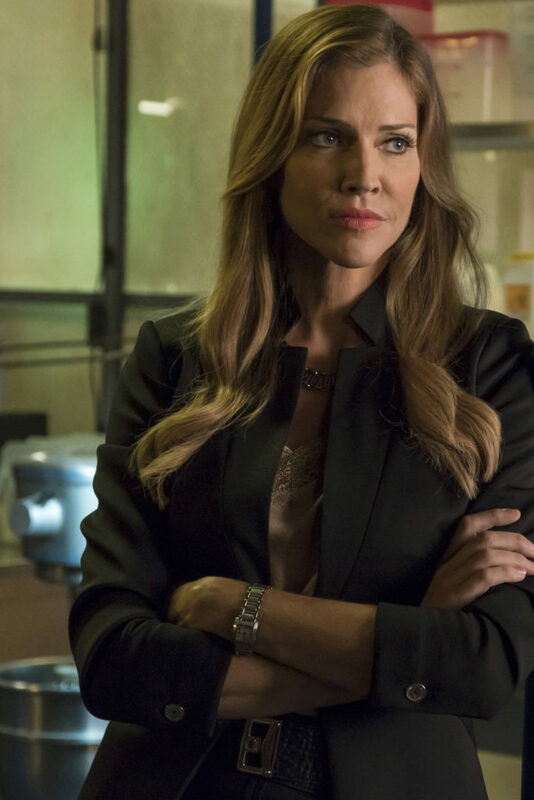 Quick recap: Lucifer’s mom escaped Hell and took up residence in high-powered defense attorney Charlotte’s body. Lucifer used The Flaming Sword to cut a hole into the fabric of the Universe and sent his mom packing to make her own world to live in. Charlotte wakes up on the beach with zero idea how she got there and no familiarity with any of the people who she had known for the last few months. But now she’s back as the defense attorney for Adrian Yates, the CEO of Performance Pudding Plus (Dan’s favorite brand). It turns out their senior food chemist, Simon Fischer, was murdered by way of being thrown into a vat of pudding. Ouch. However, Charlotte and Adrian are less than helpful when they refuse to turn over the security tapes because it’s more important to keep a proprietary pudding recipe under wraps than help find Simon’s murderer. Obviously. It all seems rather fishy, but Adrian assures our Detective Chloe Decker that he’s reviewed the tapes and nothing helpful can be seen. All Pudding Plus employees with access to the lab where Simon was murdered have solid alibis, except for Grace Foley: a former partner of Adrian’s who left the company to start her own, Heavenly Pudding. The only problem is, despite Grace’s pudding being sub par, Pudding Plus and Heavenly Pudding were actually merging so she had no motive for killing Simon. In fact, Simon had offered to sell Grace the secret recipe but he died before she could agree to his terms. Does this mean that Simon didn’t know about the merger? It would seem so. Speaking of Simon, the guy was in renal failure (!!) and only had days to live before he died in a vat of scalding pudding. So what exactly happened? The pudding was poison: well, a slow poison as two of Pudding Plus’ secret ingredients when combined made the stuff so plus as to actually form a hard to detect toxin which caused renal failure over time. When Simon tried to tell Adrian about the poison pudding but wouldn’t listen, Simon staged the murder and killed himself as a last-ditch effort to expose the company. Well buddy, it worked. So, what has Charlotte Richards been up to since she’s back to being herself? Well, she’s trying to convince herself that she’s not crazy and putting on a brave face so no one will know that she’s been missing time. Never mind the fact that she has a new place she doesn’t remember getting, a scar that she doesn’t know how she acquired, a family that’s left her, and a whole bunch of wine she doesn’t really care for. Basically, life is kind of scary for her. Things get even worse when she mistakes Dan’s attitude toward her and Lucifer’s repeated voicemails about needing to see her as sign that she’s sleeping with Mr. Tall Dark and Handsome (aka: Lucifer). Lucifer is reasonably freaked out by the whole situation and I don’t think he’s ever run so fast from a woman in his life. 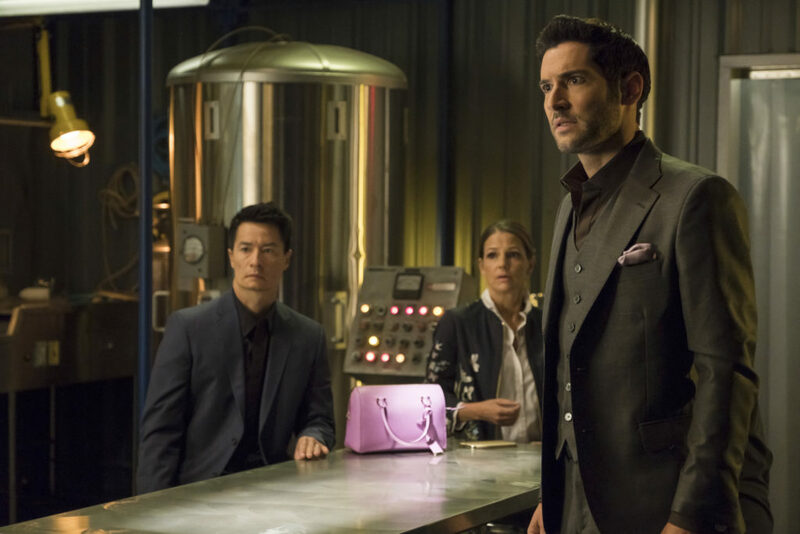 Charlotte breaks down and confesses to Lucifer about her missing time. Not only that, during her missing time she felt like she was stuck in a terrible reoccurring nightmare. Apparently, while mom inhabited Charlotte’s body, she relocated Charlotte’s soul to Hell: literally. An unusually empathetic Lucifer kindly councils Charlotte on how not to end up back there; he is the Devil, after all. Taking this advice, Charlotte decides to turn over a new leaf in her life in order to clear her ledger and relieve some of her guilt. The first real step in that direction was handing over the security footage that led to solving the case. Good on you, girl! Would it shock you to know that adorable not so-little-anymore Trixie has a potty mouth? It’s true! She has to answer to a swear jar each time she commits an offense, but with the help of Lucifer, finds a workaround. Instead of outright cussing, she’s adopted phrases like “mother flunker,” “cluster duck,” and “go to shell” to use at school. Clever girl. Chloe takes some advice from Lucifer and decides to do away with the swear jar, but not before explaining to Trixie the reasons behind the rules. She accepts that she can’t make Trixie do the right thing, but hopes that she stops looking for loopholes because if you always look for them then you will always find them. Over in Lucifer’s world the battle rages on against his father. Instead of letting him get into his head and teach him lessons (which are just mind games to Lucifer), he’s going to swear off accountability, responsibility, and being affected by his father, in general. This mentality actually gives way when Lucifer feels bad for what Charlotte has been through. To use his own words, he feels accountable. Gasp! Lucifer and Dan have a moment when Dan is trying to decide if he should keep eating the pudding or if it’s a sign. Lucifer suggests that he not let God get inside his head and to learn from Lucifer’s mistakes. Cute. Lucifer really has some daddy issues in this episode. Ever heard of Occam’s Razor, Lucifer? You should look it up. Dan has a real pudding problem. Thankfully, Ella helped him out. Charlotte had an epic near-breakdown and almost shot a guy. Apparently, she missed on purpose? There’s more to this lady than we know. Charlotte suggests Dan and her go out for coffee after basically blowing him off the whole time. Well, that’s progress. Lucifer realizes that despite all of the cosmic mistakes and craziness of his mother, he knows that it came from a place of love and he’s really going to miss her, more than she’ll know. Awww!